Here at BlendToTheEnd.com we like to showcase a variety of different blending machines. I was at a friends on Thanksgiving and was talking about my Vitamix, when a friend mentioned they recently purchased a Nutribullet. This made me curious as I really never took the time to look into the Nutribullet blender. I read an article over the weekend that stated the top 3 selling blenders on Amazon.com are Nutribullet, Vitamix, and Ninja blenders. I would expect the last two, but never expected that the Nutribullet blender would be in the top 3 on a site like Amazon. After seeing that Nutribullet was in the top 3, I decided to take a look at one of the popular Nutribullet blenders, the Pro 900 series. The Nutribullet Pro 900 Series has a solid power output at 900 watts, compared to 1000 for the Ninja and over 1500 for the Blendtec and Vitamix models. If you are looking to make simple smoothies, the 900 watts is plenty of power to make those tasty green smoothies. 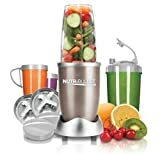 Afer reading reviews on comparable blenders, we at BlendToTheEnd.com would recommend this blender as a middle of the road machine that is capable of making smoothies, soups, and dips. Below is the product information that can be found on Amazon.com along with a link in case you are interested in learning more. I would note that one of the great things about this product is that it comes with a number of different containers which can be used for a variety of recipes. If you have any questions regarding this machine, feel free to contact us! NUTRIBULLET PRO 900 SERIES – a NutriBullet with 50% more power (that’s 900 WATTS of power versus our standard 600!) and more than twice the RPM, so you can Blast like a Pro! If I will buy this product can it have an australian fitting for power connection or shall I need a transformer or adaptor.I have a bad experience the juicer that I bought last August this year. Thanks for for letting me know. Based on what we have read, you’ll need an adapter. Thanks for the question. Let us know if we can answer anything else! I am looking at the Nutribullet Pro 900 in addition to my Ninja 1000 series. Basically, because of all the extras that come with the Pro. But I do love my Ninja. The Ninja didn’t have any of the smoothie stuff when my came out (other models followed about 6 months later). If Ninja had been totally smart, they could have cornered the market by making the smoothie glasses compatible with all series of Ninja. I did mention this to customer service, but they didn’t really care. Mainly, is it worth it to own both? BlendToTheEnd.com agrees with you, in that Ninja could have cornered the market. They definitely missed out on a huge opportunity. With regards to your question, we think it comes down to whether or not the Ninja is still in solid working order. We wouldn’t suggest buying another machine just because of the accessories. Next month, Vitamix is coming out with a compact blender that is going to start competing with some of the other self serve machines. The only difference is that this has a higher price tag. If your Ninja machine isn’t working as well as expected, then we would definitely suggest taking a look at this machine and others within the same price point. Please let us know if you have any other questions. Thanks for visiting our site!